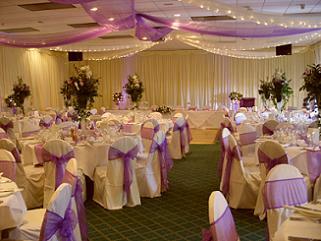 Party Linen provides a professional wedding reception décor and drape hire service throughout the UK. Our wedding wall drapes, bridal backdrops and ceiling swags will help you create a visually stunning and elegant atmosphere you and your guests won’t wish to leave. So whether you wish to transform a modern hotel suite or produce a totally themed Wedding, we have the equipment and expertise to make your big day completely exclusive. Our professional drape system is fully flame retardant, freestanding and totally unique in the UK. All we need to give you guide quotation is the dimensions of your venue LxWxH and a few pictures, you can take them on your phone and email them to sales@partylinen.co.uk. Prices start from just £1000.00 and we also hire lighting, star cloth, candelabra, dance floors plus much more, please visit www.partylinen.co.uk to find out how Party Linen can transform an ordinary space into an extraordinary place.